Several years ago, I tried out iTunes and really enjoyed the experience. I came from a Winamp background and really liked having a fast loading application. On top of that, I am a computer geek, so I already know where all my files are on the OS filesystem. Anyway, after using iTunes for a little over a year and hundreds of songs purchased later, it was starting up slower and slower. Updates to Quicktime/iTunes was coming a little too often– practically every time I started up the program, I had to download an update… which was quite annoying. Overall, the program was getting bloated on my Windows XP machine. So I uninstalled and switched back to using Winamp. It was fast and now also offered a music library for managing songs. As good as Winamp is, it doesn’t solve one problem I as a geek have. I use multiple computers to get my work done. One at work, several at my apartment, and even several at my parents house. I don’t want to drag my music/files everywhere I go just to listen to it. (I’m a big enthusiast for Cloud Computing). So I came across this post on 20somethingfinance.com (one of my favorite financial blogs) on LaLa. I started using it and I’m loving it! I have yet to try this, but supposedly if you already have a song on your computer, you can get it on your LaLa playlist for free. 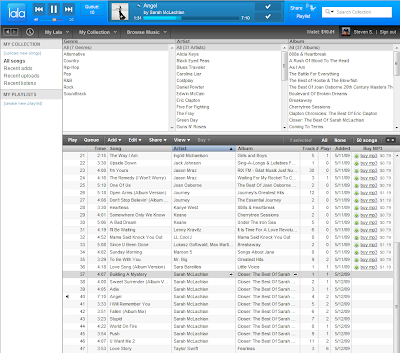 Now, I’m not saying this is a complete replacement for iTunes/Winamp. If you are playing music on the go and disconnected from the Internet, you’ll still need a music player application. This is just a awesome service for when you are connected. Give it a try, you get 50 free songs to add when you sign-up.